Congratulations to those who organised and attended the “WALK AGAINST SKYRAIL”. The event was well attended (900+) and received significant media coverage. One significant point we’d like to clarify is the proposed height of Skyrail. The most frequently mentioned height of 9 metres (i.e. approx. 2 stories flat roofed) is the distance between street level and the base of the concrete railway line structure only. The below diagram, put together by the No Skyrails group, shows the completed structure’s heights – at stations, between stations and in comparison with surrounding single storey, pitched roof homes. Even though the structure’s width is not depicted, the structure will dominate the skyline and will have major impacts on access to sunlight and rain water for the surrounding areas (ie. nearby residences and the proposed below Skyrail public parkland). 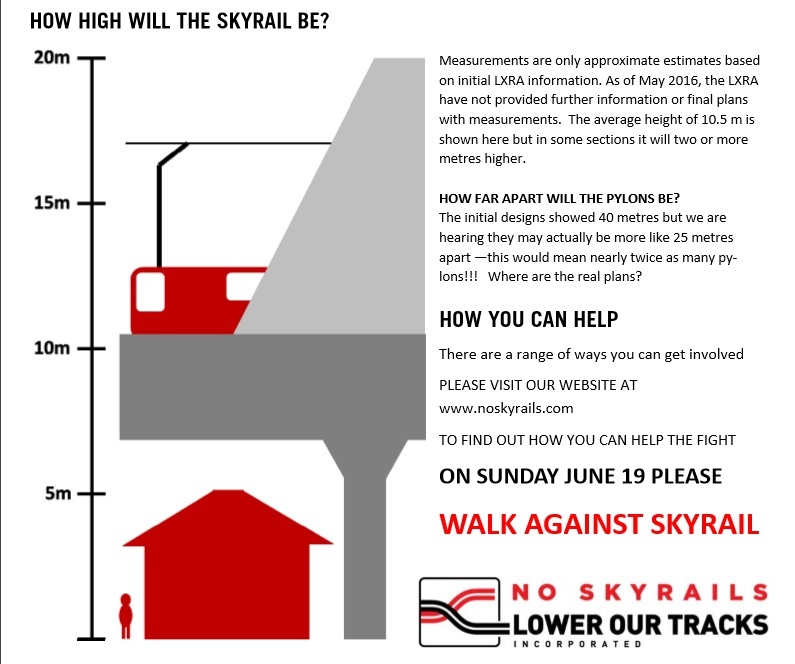 GERA has been asked by the No Skyrails/Lower Our Tracks folks to advise our readers of the below “Walk Against Skyrail”. While we believe that the removal of level crossings is a long overdue of State Government priority, we also believe that, given the magnitude of the proposal, there has been insufficient open analysis and assessment of possible options and their impacts. GERA supports the Lower Our Tracks Inc. in their quest to ensure the best outcome is achieved and encourages readers to learn more by attending the Walk. Below is information, supplied by Lower our Tracks, about the ”Walk”. It is followed by additional information on a recent Ministerial Amendment to all Municipal Planning Schemes impacted by the proposed Caulfield Dandenong Level Crossing Removal Project. We are keen to get as many people as possible coming along to the walk so that they can see just what the scale and impact of this proposal will be. 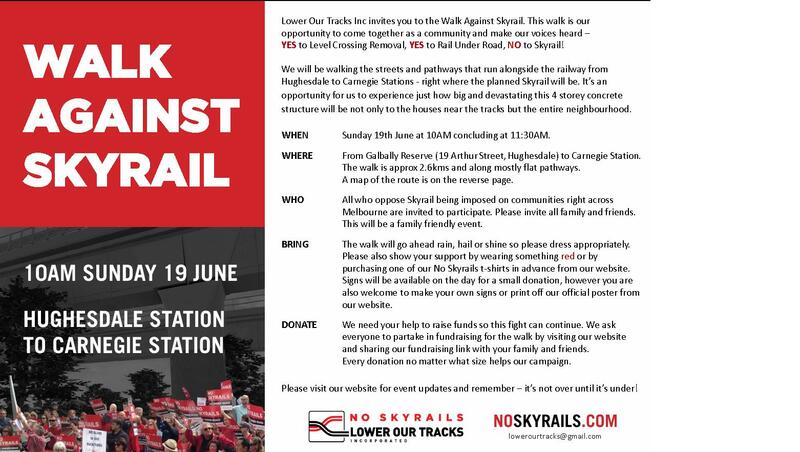 We are asking that anyone who cares about the impact of this proposal, their families and friends join us in numbers at the Walk Against Skyrail. Recently we had news that the planning minister Richard Wynne has put through an Amendment GC37 to the planning scheme – this was very unusually put through on a Friday – and is wide sweeping in its impact – it gives the State Government full power over any other overlays or authorities (such as the council) to carry out works. Lower Our Tracks Inc is not political – it is a community group with members of all backgrounds.